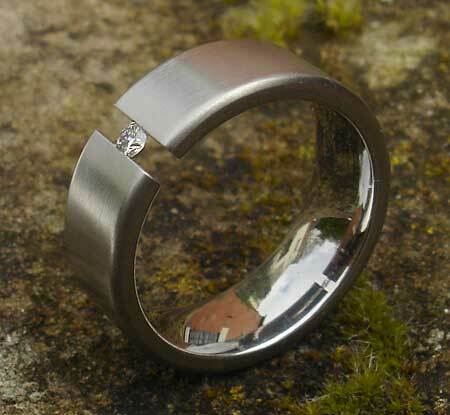 Flat Tension Set Titanium Engagement Ring : LOVE2HAVE in the UK! 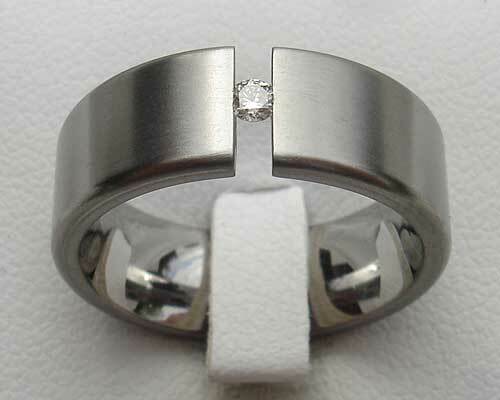 A flat profile tension set titanium engagement ring. The white diamond size is a 0.06 carat, and the ring itself measures 7mm in width. Featured here it is shown in a satin finish, but polished is also available on request. We think this ring works very well as the diamond is not as tall as the more significant stones, so therefore the wall thickness is thinner making the ring feel very comfortable to wear. As indicated by our other tension set rings it is vital to use high-grade titanium which we do for all our tension set rings, this ring being one no exception. We use aircraft grade titanium for its extra tensile strength, crucial for holding the diamond securely in place. It is not practical to resize rings made from this grade of titanium. It may be possible to resize up slightly (depending on the design of the ring) but not down. Precious stone(s) Available: 1 x 2.5mm/0.06ct white diamond.